A peer-reviewed study authored by Dr. Shelly Friedman, D.O., F.A.O.C.D. and supported by Patricia Schnoor, BSBA, confirms that low-level laser therapy (LLLT) with Capillus® may play a considerable role in the treatment of androgenetic alopecia for females, given the impartial evidence illustrating favorable hair regrowth results. The research was published in the June 2017 edition of Dermatologic Surgery, the official journal of the American Society for Dermatologic Surgery, encouraging familiarity of LLLT as a practical method of fighting hair loss at home within the greater medical community. Dr. Friedman of the Scottsdale Institute for Cosmetic Dermatology is a board-certified hair restoration surgeon with nearly three decades of experience treating over 15,000 patients with hair loss. Patricia Schnoor is the head of quality assurance and governmental affairs at Capillus, overseeing the assembly, testing and quality control for Capillus’ line of FDA-cleared at-home laser caps. The researchers concluded that low-level laser treatment administered for 30 minutes every other day for 17 weeks is both safe and effective in treating androgenetic alopecia in healthy females between the ages of 18 to 60 with Fitzpatrick skin Types I to IV and Ludwig–Savin Baldness Scale I-2 to II-2 baldness patterns. No side effects or adverse reactions were reported by any subject at any time during the study. For more, view the published abstract on Dermatologic Surgery, June 2017 – Volume 43 – Edition 6. Capillus proudly offers hair regrowth products and medical devices recommended by hair restoration physicians around the world for both men and women with hair loss. Capillus’s premiere product lines include low level laser therapy (LLLT) devices that are FDA-Cleared and manufactured in the USA under the highest quality certification standard for the medical device industry (ISO13485). 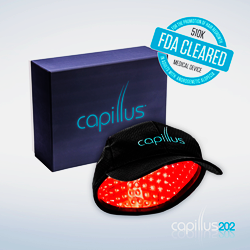 Capillus272 Pro, Capillus 202, and Capillus82 are light-weight and battery-operated laser therapy caps for at-home hair loss treatment, used 30 minutes every other day and worn discreetly under a sports cap. The Capillus272 OfficePro is for laser therapy sessions administered in salons and clinics for clients seeking introductory treatment. Capillus laser therapy devices feature more lasers than any other FDA-Cleared clinical device on the market for non-presrciption sale. Capillus offers additional products for clinical hair therapy and scalp health as well as keratin hair fibers for temporary concealment of thin hair. Readers are invited to visit http://www.capillus.com to learn more about Capillus hair regrowth products and laser therapy medical devices.